It was a busy and exciting weekend. Jordyn and baby Kendyll were dropped off with the truck load of gear needed to take of a baby for the weekend. Strollers, bassinet, bouncy chair, car seat, bottle warmer, bottles and miscellaneous other paraphernalia that a ten pound baby might need. Jordyn brought a backpack. From the onset, I was a little nervous. Babies are not my best thing. I do well with toddlers and young children-can relate well to them (quit laughing) but the babies not so much. And Kendyll had been wholly and completely breastfed all her young life. Drank three bottles (how much was in the bottle no one ever clarified) ever. Ever! Luke and Ally were headed off to Matagorda Beach and I was going to feed the baby-somehow. Ally fed Kendyll right before she left so I figured we had a couple of hours before problems would set in. We loaded up my little car and went to see my mom, affectionately known to her great-grandchildren as Granny Nanny. She is “Nanny” to my kids. Mom was very happy to see us. Earlier this week, she started having severe pain in her hip and has not been able to get around well. She is pretty much confined to a wheelchair. Before she could at least tinker around her room, try on all her clothes, fiddle with her make-up but now cannot really walk without assistance. It has been a blow to her and I know she is depressed. We have an appointment with the orthopaedic guy Friday. Maybe she fell and actually has a fracture (don’t think so) or maybe her arthritis has flared up in the cool, damp Texas fall. But she has been more confused and certainly less happy. But the sight of Lauren, Jordyn and Kendyll put a big smile on her face. She loves Jordyn and thinks she is the smartest child on earth (no disrespect to her other great-grandchildren, Jordyn is just the one she has seen and known the longest). But babies sure make her happy as well. I love the picture of her and Ken on the bed. 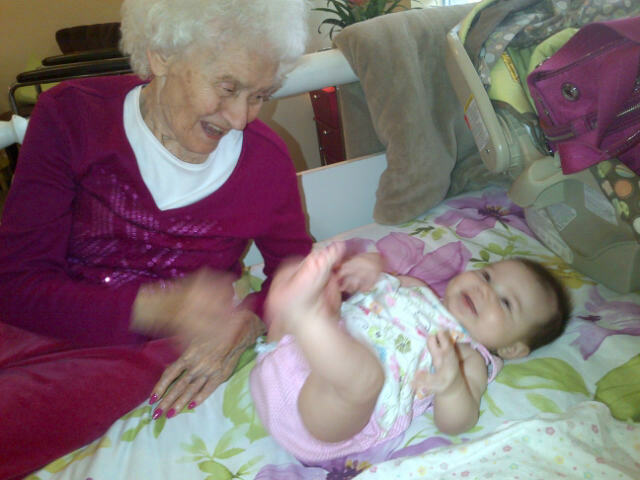 Kendyll is smiling at her great-grandma. After our trip there, we got home to feed horses. We were working with the guy down the road to come shred our pasture (that means mow the pasture-don’t ask me) so things were hectic. I tried to feed Kendyll and she did not eat at all. Picture a five-year old with all her toys out, an unhappy baby, six dogs, and Lauren and I trying to coordinate the tractor guy and four horses. It was pretty overwhelming. 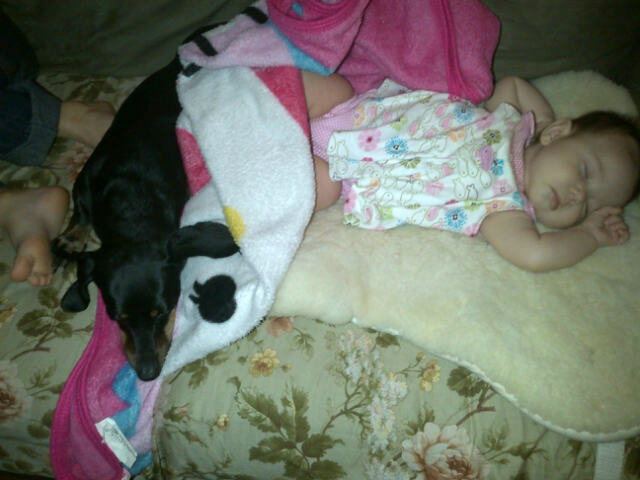 Kendyll sleeping on the sheepskin pad with Lula keeping close watch. The tractor guy finished at sundown. Kendyll woke up. She finally ate four ounces. She fell asleep again. By nine o’clock, the baby was in the bassinet, Lauren and Jordyn were having a slumber party in Lauren’s room, the horses were out on the newly mown pasture, the dogs were divided up in three rooms and I went to lay down. I just kept laying there waiting to hear the baby. Nothing! I kept laying and waiting some more, just in case. Nothing! Sidenote: Lauren was horrified that I had Kendyll in the front bedroom and I was in my room next door. We did not have a monitor. How would I be able to hear her? I told her people successfully took care of babies without monitors for thousands of years. I would hear her easily in the little house. I must have fallen asleep as I awakened to baby noises (not crying) around 3:00 a.m. Not bad for how little she had eaten. But this time was harder. She wanted nothing to do with the bottle I offered. Lauren and Jordyn awakened to baby squalling and thought I had slept through her cries. Instead, they found me in the living room, baby in my arms trying to convince her to try the bottle. It was mommy’s milk, I promised her, just from another container. She was not convinced. Maybe another ounce drizzled down her throat as she cried but she never took the bottle. She fell asleep around 4:00 (probably worn out from crying). I figured I might as well feed the horses and dogs. Saturday started early. When Kendyll awakened again around 6:00 it was obvious Ally was going to have to come get her. She had a total of maybe five ounces and no wet diapers. I had tried my best. At least Ally had gotten a night off. Lauren and Jo went out to clean stalls and get horses out. It was a still, warm morning with a heavy dew covering the ground. We still had tree branches and wood left over from the removal of the giant old tree. We decided it would be a good morning to burn off the reminders. 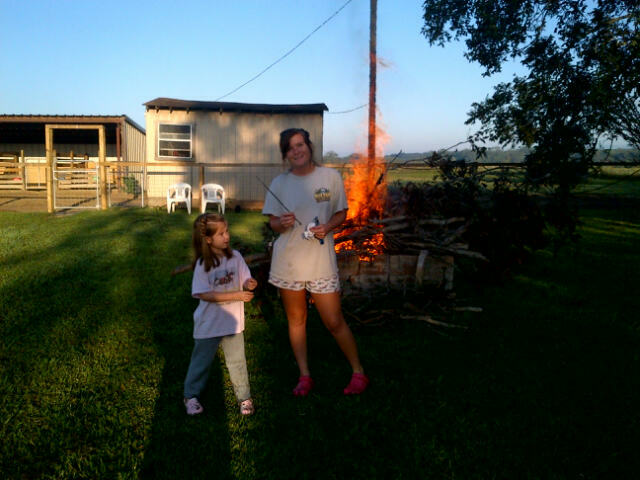 Always one to promote healthy lifestyles, we decided to roast some marshmallows for breakfast. Jordyn thought it was great. Roasted marshmallows for breakfast-only at Grannys! Ally arrived. Kendyll ate a long and satisfying breakfast (no marshmallows). Jordyn and Kendyll went on with Ally to spend the weekend at the beach. Lauren and I were kind of relieved and went in the house to get ready to ride some horses. Suddenly, the whole horse, dog, mom in the nursing home thing was looking a little easier to me.